So in the past I haven't been all that great at decorating for Halloween. And honestly it kind of bummed me out. Halloween is fun, especially since we have a little girl who loves Halloween now! 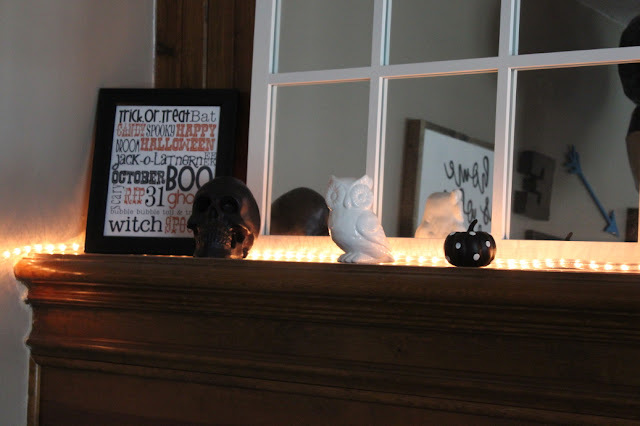 This year I bought myself a couple Halloween things for decorating and I definitely love how the mantel turned out this year. However I only hope to show you this first picture as long as you don't judge our fireplace which has been completely overrun by Legos! 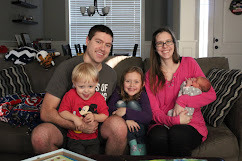 So it's not much in comparison to some of the blogs I have seen but Addison loves it and I like it so much better than past years. The sign I got as a printable a couple years ago but I don't remember where now. The skull was from Target a couple years ago. The owl was from the Dollar Spot at Target this year and I couldn't resist because I love owls! That small pumpkin was in a pack of four pumpkins also from the Target Dollar Spot. The bats are just cut from cardstock traced from an outline of a bat I found online. The cat, book, and the ghost wood tags were from an Etsy shop. They were slightly smaller than I expected but I still love them! 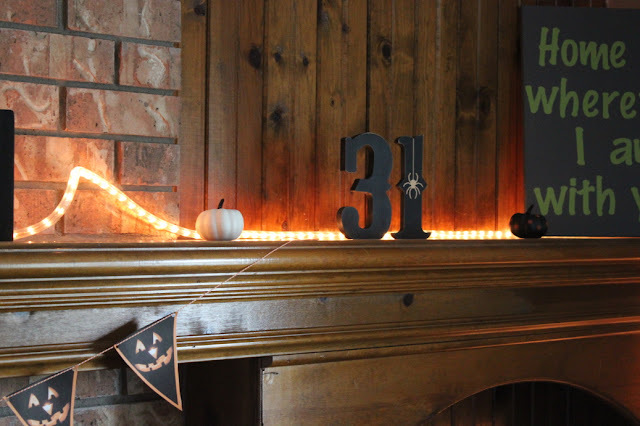 The candy corn string art was from Hello Sunshine Decor and I love it. 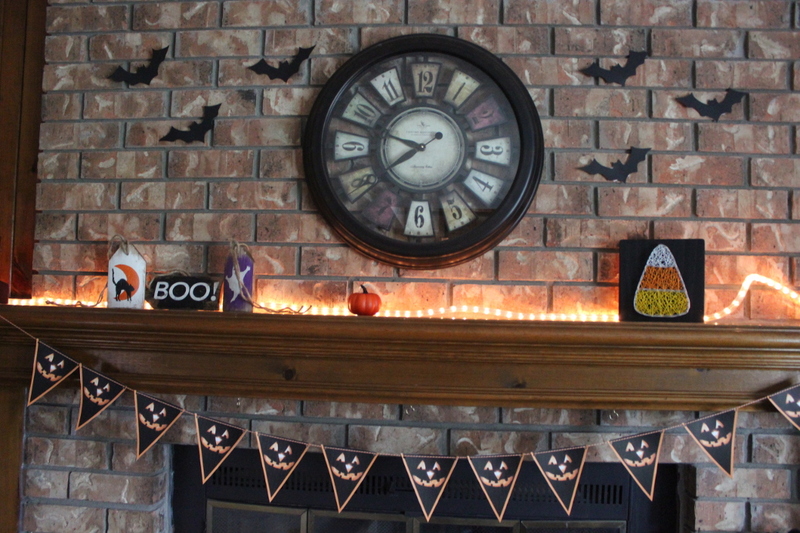 The Halloween bunting was also a printable that I found (check out here) just printed on cardstock, cut out and hung up. The 31 was also from Target Dollar Spot. Does anyone else love the Dollar Spot as much as I do? We have a few other things around here and there but nothing much more. But I love how the mantel turned out this year. Sometimes it's really hard with having such a long mantel finding the right things in the right sizes for something so long and massive. But this year I'm pleased with it. 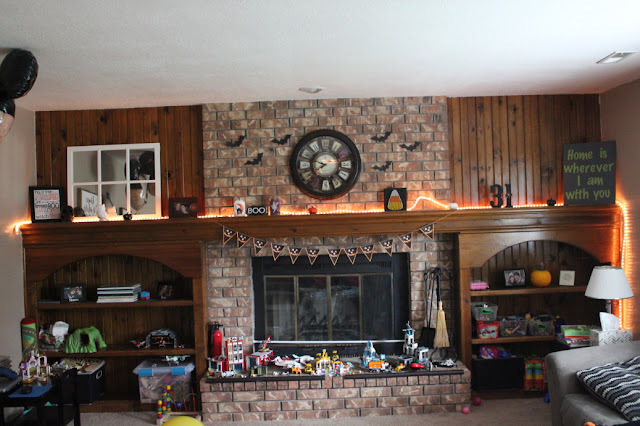 Comment below: Do you decorate for Halloween? If so, what is your favorite Halloween decoration?